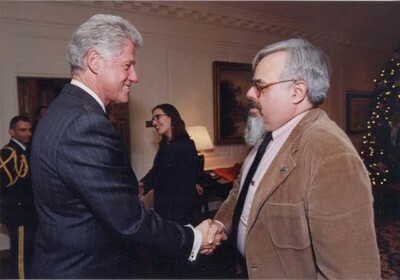 Stephen Suleyman Schwartz with Bill Clinton, 2000. Photograph by White House Staff. 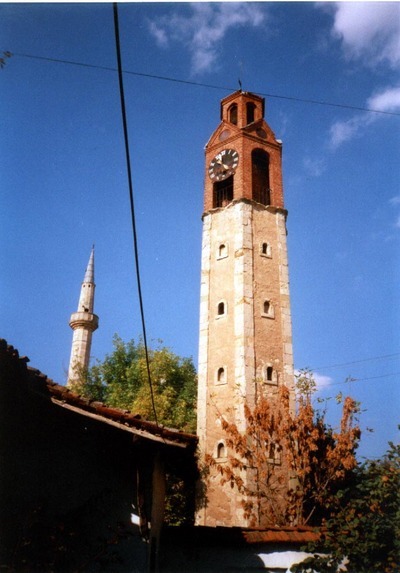 The Ottoman sahat-kulla and minaret of the Grand (Imperial) Mosque, Prishtina, Kosova -- Photograph 2000 by Stephen Schwartz. 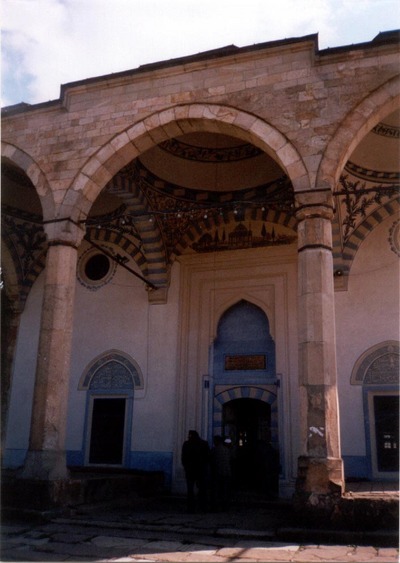 Portal of the Grand (Imperial) Mosque, Prishtina, Kosova -- Photograph 2000 by Stephen Schwartz. 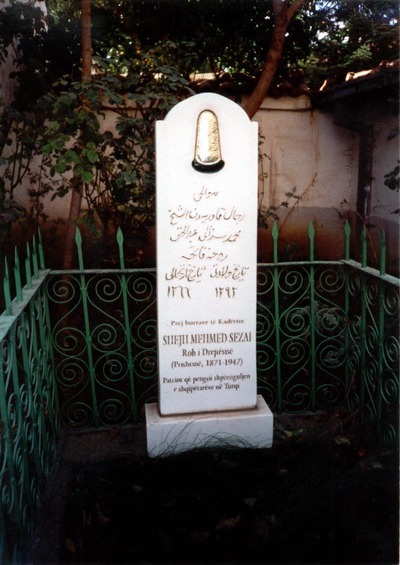 Grave of rahmetli Qadiri Sufi sheh Mehmed Sezaj, Prishtina, Kosova -- Photograph 2000 by Stephen Schwartz. When the NATO intervention in Kosova began in 1998, it was fairly common, all over the world, to hear the Albanians in the Kosova Liberation Army (KLA) denounced as terrorists, jihadists and otherwise as Islamists. Given that Kosova Albanians are 90 percent Muslim, this was probably a predictable development. The charge that the KLA was jihadist or Islamist represents one of several aspects of the Kosova campaign that have made it again relevant, following the international decision to act against the Libyan dictatorship of Mu'ammar al Gaddafi. As in Kosova, NATO intends to defeat Gaddafi by judicious use of high-altitude air power, rather than by putting American, Western European and other allied "boots on the ground." But more significantly, as in Kosova, the Libyan liberation forces are accused of alignment with al Qaeda, and their devotion to Western ideals of freedom and pluralism is questioned. The Kosovar Albanians have survived the slurs of their enemies. But in a development worthy of irony, after the Kosova Republic declared effective independence on Feb. 17, 2008 (in reality, its second such declaration, with the first proclaimed in 1990), only 19 Muslim majority countries have recognized it as a sovereign state: Albania, Afghanistan, Turkey (whose language is spoken by a small community in Kosova, and which seeks to reestablish the historic Ottoman influence in the Muslim Balkans), Senegal, Burkina Faso, Sierra Leone, the United Arab Emirates (UAE), Malaysia, the Maldives, Gambia, Saudi Arabia, the Comoros, Bahrain, Jordan, Mauritania, Djibouti, Somalia, Qatar and Oman. The remainder of 77 states accepting Kosova independence comprises the U.S., Canada, most of the leading nations in Western Europe, Japan, South Korea, and Taiwan, among others. With support from major Islamic powers like Turkey, the UAE, Malaysia, Saudi Arabia, Jordan, and Qatar, Kosova might enjoy sufficient status in the Muslim world. But the roster of Muslim-majority states that have refused recognition to the young republic is also lengthy, totaling 26 and including Algeria, Azerbaijan, Bangladesh, Bosnia-Hercegovina (which has a Muslim plurality of 48 percent), Egypt, Guinea, Indonesia, Iran, Iraq, Kazakhstan, Kuwait, Kyrgyzstan, Lebanon, Libya, Mali, Morocco, Niger, Nigeria (51 percent Muslim), Pakistan, Sudan, Syria, Tajikistan, Tunisia, Turkmenistan, Uzbekistan and Yemen. Further, Israel has declined to recognize Kosova. Israelis fear that Kosovar independence will be an incentive for a similar unilateral posture by the Palestinians. It would seem that Israeli anxieties on this matter are misplaced, in that the Palestinian Authority has also refused Kosova recognition. The lack of enthusiasm for Kosova shown by many Arab and Muslim countries should be taken as evidence that allegations of radical Islamist tendencies in the Kosova independence movement were and are false. Nevertheless, Kosova remains a Muslim-majority state, and since the end of the main conflict in 1999, the country has been targeted by extremist Muslim preachers and flooded with fundamentalist literature. Recent months have also, it seems, brought the spirit of protest visible in the "Arab Spring" -- or better, the Muslim Spring, since Iran is a key factor in determining the political future of the lands of Islam -- to the Muslim Balkans. After the Egyptian revolution, the discourse on change in these countries has followed a dual path: proposals for democratization and pluralism are accompanied by a stimulus to "reform" through Muslim fundamentalism. Discontent among Kosovar Albanian Muslims was aggravated at the beginning of the 2011 academic year. Tërnava purged the Faculty of Islamic Studies in Prishtina, the Kosovo capital. He revoked the academic autonomy of the faculty, dismissing seven well-qualified and experienced professors — "the magnificent seven" — and replacing them with radicals. As described in a protest statement issued by the seven on May 25, Islamic studies in Kosovo will now be directed by "'lecturers' without the appropriate research credentials or with fake titles and degrees, based on unverified diplomas, which are issued by questionable educational institutions without accreditation anywhere in the world, and sold for cash in the streets of Cairo. ... dubious professors, influenced by foreign ideologies, with rigid and extremist orientations, usually backed by generous donors. ... At least three of the new professors, in addition to their teaching salary paid by the Islamic Community of Kosovo, are also paid by foreign groups to promote their beliefs." The new cadre of "plagiarists," according to the declaration of the seven fired professors, receives double salaries of 1,000 Euros each ($1,300 per month — a fabulous sum in Kosovo). The effect of Tërnava's usurpation, in the words of the seven, will be to drive Kosovar Muslim religious students abroad, where the cost of reputable theological training will be higher, and "they will be at even greater risk of influence by rigid and radical interpretations of Islam." The seven warned that since the aforementioned Rexheb Boja had been replaced by Naim Tërnava, "personal interest rules the Kosova Islamic Community leadership while human and religious rights are violated." They called on the Kosova ministries of education and justice to intervene against the treatment inflicted on the seven, declaring, "the Islamic Community of Kosova is not the private property of some individual with license to use it at others' expense, according to his personal caprices and resentments. There is a need for responsibility and accountability." Rather than a new outpost of radical Islam, Kosova may have become the first place in Europe where the spirit of the "Muslim Spring" inspires an outcry against corruption and the accommodation of radicalism. Parallels with Libya should not be the only reason to pay new attention to the place where the U.S.-NATO doctrine of protection against violation of human rights and the imposition of radical ideologies was first, and successfully, tested.